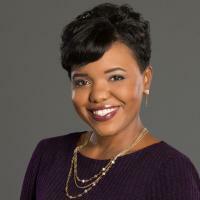 Emmy winner Danielle Wiggins is currently the morning traffic reporter and anchor/producer of the midday news for WKYC-TV, Cleveland’s NBC affiliate. Danielle is truly a multi-skilled journalist. Her background includes on-air and production work in television, radio and digital media; as well as a stint as an adjunct instructor in the School of Journalism and Mass Communication at Kent State University. She is also the creator, host, and producer of the Emmy winning series "Rising." "Rising" rose from TEGNA’s media initiative to transform news content. It tells the stories of people in Northeast Ohio who have overcome obstacles to achieve success and are inspiring others to do the same. Before joining WKYC, Danielle was the main producer and correspondent for “The Regina Brett Show” on 89.7 WKSU, Northeast Ohio’s regional National Public Radio (NPR) affiliate. The Regina Brett Show won multiple state and national awards under Danielle's leadership, including an Ohio Excellence in Journalism award for best radio show. Danielle holds a bachelor’s degree in broadcast journalism and a master’s degree in media management from Kent State University. She is always looking for opportunities to develop new and engaging content for multiple media platforms. "Every successful journey has a destination"